Justified returned this week, with their first episode since the death of writer/author/creator/legend Elmore Leonard. I was happy to see they took the time to pay tribute to the King of Cool before the premiere. 1. Man, this is darker than usual. 2. 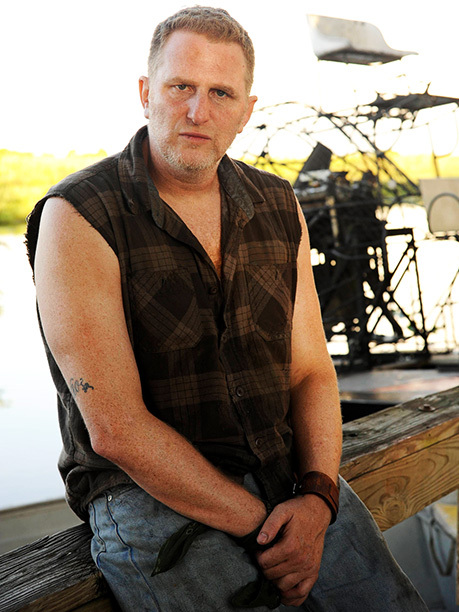 Michael Rapaport looks the part of Darryl Crowe, but he sure doesn’t sound it. 3. Boyd in a corner is a sad and scary Boyd. 4. 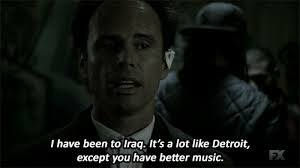 Justified‘s Detroit is far scarier than The Wire‘s Baltimore. 5. Man, I’ve missed that dialogue. Steven: Far-far scarier than Baltimore, I agree. But it features MADtv‘s Will Sasso and Kids in the Hall‘s Dave Foley eating donuts and discussing Tim Horton’s. I hope they don’t go down to Mexico at all–that might be too many Breaking Bad allusions. I hope they stay with sketch comics from The Great White North. I also thought that whole exchange with the chainsaw and Sanny Tonin getting shot in the back of the head was spectacularly sinister. Perhaps more so even than Omar Little’s boyfriend getting tortured to death and left on display. Well…maybe the chainsaw guy is just more recent. Michael Rapaport as Darryl Crowe Jr.
As for Michael Rapaport, he will always be awkward, bird shooting Gary from that episode of Friends. I can’t really see him dumbing/toughening himself up enough to play this kind of alligator country thug. But I’m certainly open to being surprised! Maybe he will be more comedic than serious–as the inclusion of Sasso and Foley indicates that we could be heading into a different kind of season entirely. Although you’re right to point out that Boyd is darker than ever. What I love about Boyd is that he’s the ultimate variable. You don’t even really need new characters each season–though we certainly appreciate them–when you have Boyd around, because each season he holds the potential to be a new character. Something I’m curious to know is what will happen with Raylan’s relationship with Winona and his daughter? Is it setting us up for Raylan the absent father, a chance to really see how backward his approach to his personal life has been and some real ramifications to it, or is this story line going to bring him around to changing his life? As much as I love him shooting up Dewey’s above-ground pool, it pained me to see him blow off his family in Miami. Get it together, Raylan! We know you’re a badass, now be a man also! Am I over-moralizing again? Are his love affairs this season going to exciting and plot driven or depressing and eye-opening? Also, which would you rather they develop: forging a Mexican connection through the Haitian, or maintaining the Canadian one through the donut improv troop? Susan: I think it would be way out of character for Raylan to actually see his daughter while he was in Miami. I mean, when we left him last season, he went back to Harlan to sit in his old empty house rather than go see Winona after she had been kidnapped by the Detroit bad guys. The Raylan of season 5 just isn’t prepared to face up to his fatherly duties. He’s still grieving and figuring it out and trying like mad to avoid Miami in the first place. I’m guessing that the long term goal of the show is to get Raylan more comfortable in the role of family man, but I doubt we’ll see it until the series finale. Raylan of this season appears to be avoiding at all costs and distracting himself with the Crowes and Harlan. The theme of this season appears to be family, and all the contradictory actions that the characters in this world take in the name of family. The Crowes are certainly not a family to model, but their issues might make Raylan face a lot of the demons he’s so desperate to ignore. As for the Canadians, it’s perfectly Justified to introduce drug-dealing Tim Horton’s lovers. I was happy to see Picker again, and even happier to see Sammy bite it in such spectacular fashion. I’m not sure how I feel about the Mexican drug business, especially if we’re going to bounce back and forth between Detroit, Harlan, Lexington, and Miami. That’s a lot of locations to keep track of, and I don’t see how you can keep everyone in conflict with each other if they’re that spread out. I’m sure they have a plan. As long as that plan includes more Art, I’ll be happy with it. Which new character intrigues you the most? And don’t say Dave Foley – he’s out for the rest of the season. Steven: It is perfectly Justified! As for the many locations, I think they’ve already set up the answer with that final scene. Clearly everyone is going to Skype each other. Instead of drawing on each other, Boyd and Raylan can threaten to close the screen if the other doesn’t comply. I think that’s some pretty high tension. Which new character is my favorite? Hmmm… that’s a tough one. I’m so intrigued to see what everyone from last season is doing that I haven’t thought too much about the new guys. I liked Dilly the stutterer, but that was a short-lived role. That being the case I’m interested to see what David Koechner’s character Deputy Sutter will add. I’ve always liked his over-the-top Anchorman style characters, so I’m curious what he has to offer in the realm of realism. This first episode was pretty front-loaded with comedic actors, begging the question, Are we going to stay with the relative dark-realism of Elmore Leonard crime, or is Justified about to get Get Shorty-style satirical? Will we see David Koechner or the Haitian again this season? Susan: Oh my goodness. I just realized what Dilly is from. He’s Randy from Monk! My mind is officially blown. The David Koechner character reminded me a lot of your DEA character in The Night Shift. I’m curious about him, but really can’t see it going anywhere. He seemed to fulfill his role as good father in Miami, harassing Raylan about being a bad father in Miami. What else is there for him? I’m curious about Alicia Witt as the lone female Crowe. Will she stay legit in Miami, or be drawn to Harlan by Dewey’s $300,000 windfall? The women in Justified are not to be taken lightly, and we’ve already seen her drive into traffic to preserve her deal with Raylan. She’s resourceful and tricky. I have high hopes for her. Even with all the comic actors popping up, this was a very dark episode of Justified. I mean, Boyd was pretty much covered in blood from start to finish so I doubt we’re headed for satire. I look forward to more of Dewey’s antics, and am curious to see where Raylan’s living this season. His living situation always seems to drum up some sort of mild mischief. Any chance he could bunk up with Constable Bob? Steven: A return of Constable Bob would definitely be a plus. Thinking about him reminds me of how much ground they covered last season, how many twists and turns, and just reflecting for a few minutes on that craziness of season four makes me hesitant to even start speculating. If the writers have taught us anything it’s that they also are not to be taken lightly and that the place we end up at the season finale will be somewhere we didn’t even realize was on our map back in the season premiere. Maybe Raylan will have to team up with an unofficial, OCD detective from San Francisco? As crazy as that prediction is, it’s probably just as accurate as anything I could come up with right now. We haven’t even been introduced to our big mystery! I also like Alicia Witt, though I’m afraid she will just become another one of Raylan’s girls. That is one blind spot the writers have. Whenever there’s a young, attractive woman, we know she’ll wake up at some point in the loving arms of Raylan Givens. I guess that’s just part of the show, though. Whatever she does this season, I’m betting it has a higher impact than answering phone calls. How is Boyd supposed to rescue Ava now? I don’t thinking bludgeoning the funeral parlor owner to death furthered his case. Especially since his Latvian wife’s last words implied she’ll be gunning for Boyd. What are the chances that he’ll turn himself in at the end of this season and take Ava’s place? Susan: The show doesn’t like to keep Boyd in prison for very long. I seem to remember that as a recurring theme in the first few seasons. Boyd gets caught, gets put in jail, and then gets out on a technicality before the credits of the very next episode. As much as Boyd knows it’s the right thing to do for him to take her place, neither he nor the show’s writers can stand to do it. That being said, I have absolutely no idea what Boyd’s next move will be, but I’m super excited to see what he and Wynn get up to this season. More Jere Burns on my TV, please. Always more. Sidenote: I love that the Florida Crowe’s illegal business is smuggling sugar across the border. Thank you, Justified, for introducing me to the illicit sugar trade. I learn something new from TV every day. Steven: Someone gets eaten by an alligator. Raylan gets suspended for doing something stupid. And Boyd is going to lose more body parts. Susan: Interesting. I fear someone (namely, poor Dilly) already got eaten by an alligator. Also, where the heck is Johnny? Poor Ava is missing all the fun. Next week: Raylan moves into his new home, Darryl moves back to Harlan and Boyd moves further down the path to missing appendages. See you then.